According to reports reaching Virgin Islands News Online, public spirited persons used buckets and hoses to try to extinguish the fire even before Virgin Islands Fire and Rescue arrived. 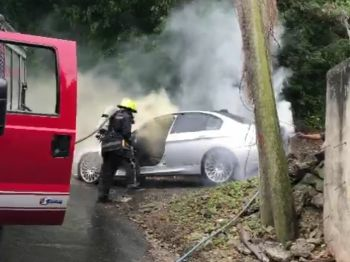 It is unclear at this time what caused the car to catch fire. 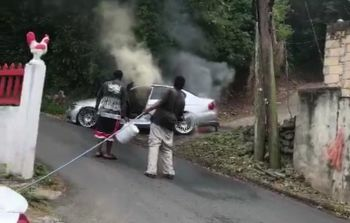 In was on April 18, 2017 at separate locations on the main island of Tortola that two vehicles caught on fire. The first vehicle fire occurred in Belmont Estate, while the second incident occurred at Long Trench. On Sunday February 19, 2017 a car was damaged by fire also in Great Mountain, while on February 12, 2017 a vehicle was destroyed after it caught fire in the Pockwood Pond area. We should ban those cheap "imports" and buy the expensive "imports" from t...g. After all it is only $600.00 per month for five years. Car fires will be a thing of the past. The last time I checked all vehicles were imported into the territory. They crush not produce at Sea Cows Bay. Does da look like a cheap import to you? It's human nature. We adjust to everything in the environment, and in fact the greater the adversity, the greater our defense mechanisms kick in to help us cope. That's a Bimmer. Must be one of two things: A "bush mechanic" worked on it or the sound system shorted. My money is on the waste of time darn "bush mechanic".